Katia Bassi, Chief Marketing Officer and Board Member of Automobili Lamborghini and Dino Salvatore Giorgio, publisher of the D'ORO Collection, present DNA Lamborghini: a unique collector's volume and numbered edition edited by Antonio Ghini that tells the story of Sant'Agata Bolognese, detailing all the models and prototypes made from 1963 to today. Each copy boasts an exclusive Forged Composite® carbon cover produced with the same technology used in Lamborghini cars, and embellished by a gilded bronze badge that reproduces the Lamborghini shield. It is bound in Leonis silk and orange leather. The photographic images are printed with a special silk-screen technique on hand-sewn cotton paper. 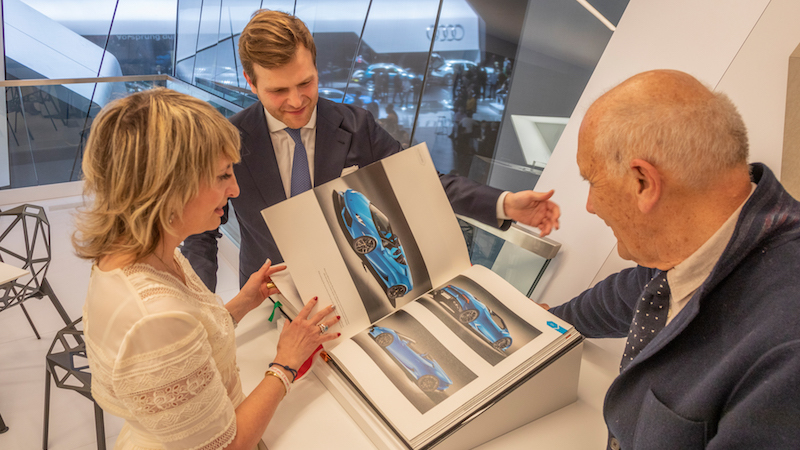 These are some details that, in addition to the original sketches signed by Mitja Borkert - Head of Design at Automobili Lamborghini - make DNA Lamborghini a real jewel of a book. The 309-page book is available at the e-shop dorocollection.com and lamborghinistore.com, at the D'ORO Collection and Automobili Lamborghini stores, as well as selected boutiques and dealers, at a price of €9,900. Piquadro presents its Bagmotic backpack produced with Collezione Automobili Lamborghini. 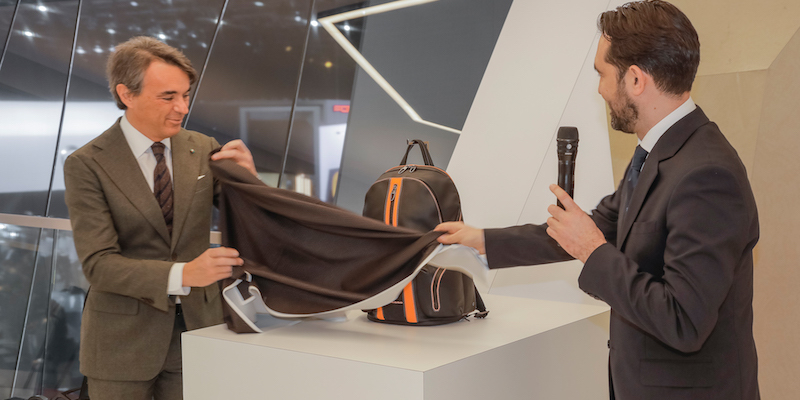 Luca Lucini, Product Manager Brand Partnerships for of Collezione Automobili Lamborghini and Marco Palmieri, President of Piquadro, a brand of tech-design accessories for business travelers, presents the Bagmotic special edition Automobili Lamborghini. The limited edition double-label backpack is a product of the shared values between two Italian companies: fine design, high-tech content and attention to detail. The backpack, conceived by the Piquadro design team, combines technical materials typical of Lamborghini super sports cars, such as use of Alcantara® and carbon fiber materials, with a high-quality matt full-grain leather giving a soft, smooth feel. The details are inspired by Lamborghini super sports cars, such as the Argos orange insert on the front that draws on the typical Y-shape found in the cars’ design, particularly evident in the seats and lights. The backpack also includes technological innovations, making is a smart backpack: thanks to the Piquadro Bagmotic technology that allows interaction via mobile phone and the Connequ app, the backpack is connected via Bluetooth to the smartphone that works as an alarm in case of theft or loss. Inside the backpack there is a pocket specifically designed to contain a powerbank that allows a smartphone to be charged by induction. The backpack is equipped with a combination lock, an anti-theft cable and a special wallet pocket with RFID protection to prevent credit card cloning. Each backpack is made unique and exclusive by numbering on the small internal carbon skin plate, a feature that distinguishes the limited series of Lamborghini super sports cars. Just 63 backpacks have been produced, reflecting the year of Lamborghini’s foundation. The backpack will be available exclusively on March 18 on piquadro.com at a price of €800. 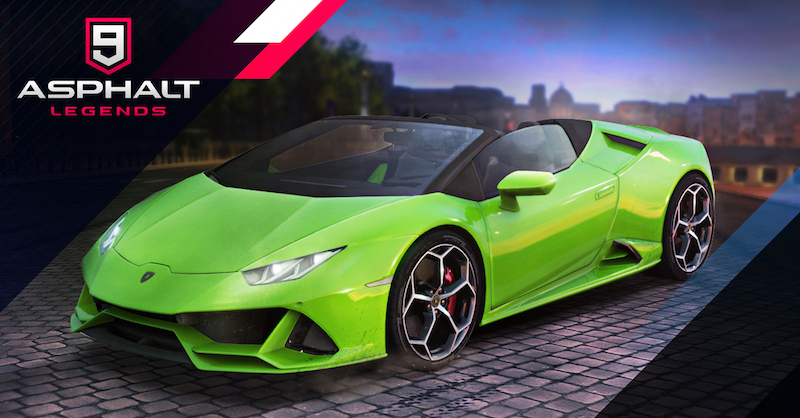 Gameloft, a leading company in the creation and development of videogames, and Automobili Lamborghini announce an exclusive partnership that unites the real world and the virtual one, with driving simulation of the new Huracán EVO Spyder in the mobile racing game Asphalt 9: Legends. The partnership continues between the two companies, which collaborated for the launch of Asphalt 9: Legends that offered the thrill of driving the Lamborghini Terzo Millennio to players across the world. During the showguests can participate in an exclusive simulation of Asphalt 9: Legends with the new Huracán EVO Spyder, and access a contest where the first five winners will receive the collectors’ 1/43 model. In addition, Lamborghini’s exhibition stand on opening days offered guests the opportunity for a discovery tasting tour of the highest quality chocolate produced by the artisan company Italian Amedei, led by Cecilia Tessieri, company founder and the first woman to hold the role of Maître Chocolatier in the world.